John Cusack Developing Rush Limbaugh Biopic Film?!?! I hate to say it, because I dislike Rush Limbaugh, but it looks like the conservative radio talkshow host is getting a biopic movie made about him, in the vein of the Howard Stern film ‘Private Parts’. John Cusack is attached to the film with his production company and it seems like Cusack will actually play Limbaugh. Betty Thomas is in talks to direct the film, which she directed 1997’s ‘Private Parts’ the biopic on Howard Stern. 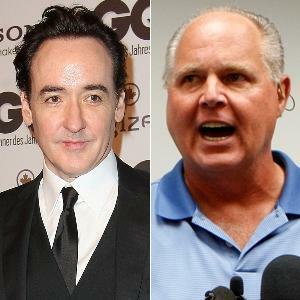 The script would explore the rise and reinvention of American Talk Radio, and Limbaugh’s continued influence and impact over the last three decades in that world,” said True Crimes Productions (Cusack’s production company) today. We also hear that this would be a neutral look at Limbaugh, and not a one-side look. I also am hearing that this project is far off as the script is not even finished. However, I don’t see this being as good as ‘Private Parts’, as Limbaugh is a joke and an overall idiot. Just like Stern, who starred in his own film said that people misunderstand him…I don’t think that is the case with Limbaugh. Plus, I wonder if we will be seeing Cusack play more biopic type of roles. He did play Poe recently, and now Limbaugh. What’s next? ‘High Fidelity’ Soundtrack Ready To Top Your Vinyl Collection!!! This entry was posted on Monday, November 5th, 2012 at 2:44 pm	and is filed under Film, News. You can follow any responses to this entry through the RSS 2.0 feed. You can skip to the end and leave a response. Pinging is currently not allowed. « Check Out the First Image from ‘Last Vegas’!! !